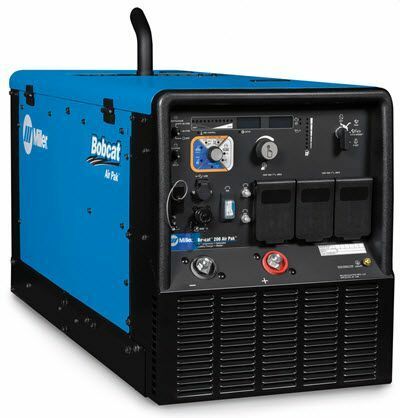 The Miller® Bobcat™ 200 Air Pak™ is a 210 amp multi-process welder, 6,500 watt AC generator and a 30 cfm at 175 psi rotary-screw air compressor. The Bobcat 200 Air Pak features a Kohler® 23 HP, twin cylinder gasoline engine with electronic fuel injection that supplies air compressor and welding power, even at idle. The Bobcat Air Pack 200 is capable of stick and MIG welding up to 210 amps. It also produces 6,500 watts of AC generator power AND 100 amps of DC current to charge 12 volt and 24 volt batteries. It even provides up to 300 amps of cranking power. The Bobcat 200 Air Pak comes complete with Miller's True Blue™ 3 year warranty and Kohler's 3 year engine warranty. Air compressor - 30-cfm rotary-screw compressor that can power virtually any air tool, including most 3/4-inch impact wrenches. The rotary-screw air compressor provides air on demand and is more reliable. It allows techs to complete tasks without having to stop to let the compressor recover, improving their productivity. The Bobcat 200 Air Pak provides 20 cfm of air output at idle or 30 cfm at full speed. Testing - Ruggedly built and rigorously tested to ANSI and CSA standards, the Bobcat 200 Air Pak is proven to withstand high temperatures, rain, salt, dust, impact, vibration and more. Its welding, auxiliary power, battery charging and crank assist systems are tested to meet the highest applicable industry safety standards. Professional appearance - The components of the Bobcat 200 Air Pak are concealed within a durable environment-resistant precision-engineered enclosure. Miller Bobcat 200 Air Pak 907706 can be used with a suitcase feeder. Miller Bobcat 200 Air Pak 907706 has a lifting eye on top of the machine. Can you run the compressor and the generator to run a small plasma gun? Miller Bobcat 200 Air Pak 907706 can run a plasma cutter. 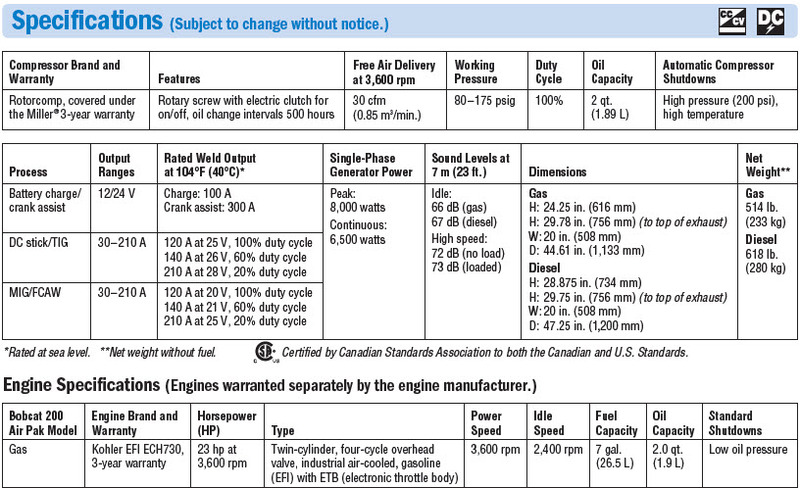 The air compressor will supply 28 cfm at 175 psi.